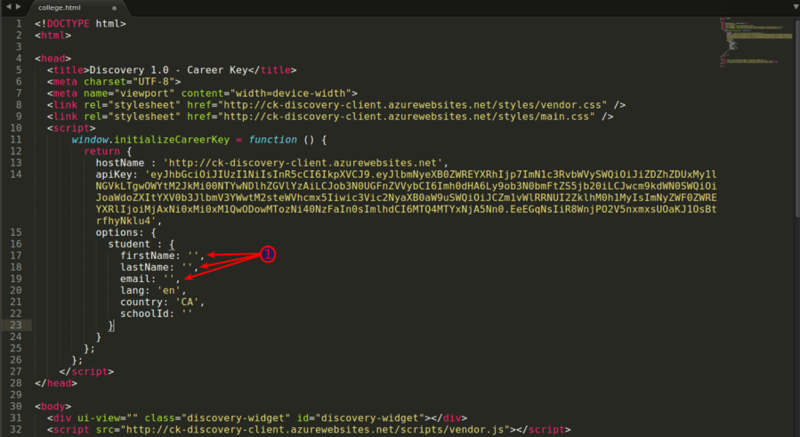 In order for your discoverers (students or clients) to access Career Key Discovery (CKD), you need to host the CKD plug in on a single page application comprised of just one html page. Once you complete installation and you link visitors to that page, discoverers will be able to access CKD, and their assessment results and data will appear in the customer action portal, Career Key Central. That is where your organization’s administrators and counselors will be able to view discoverers’ data and engage with them. Start by reviewing the prerequisites to make sure you have all the information to get started. Learn how to install a CKD plug in on your website. The exact URL where you want to host the plug in. Only registered users of your website should have access to the page. How your organization wants to configure the plug in so that the CKD assessment shows discoverers the right content. (Default: Career and Majors, US-English locale) To see more options, visit Resources > Set Up My Organization. You may need to request this information from your organization’s primary contact on the Career Key account. How to get the values in the code for first name, last name and email address of the user who is logged in to your website. If you want to use different user values or create a custom interface, then contact us at support@careerkey.org. How to host an html page either in your website or separately. As a Technical Contact, you receive an invitation to activate and sign into your Career Key account. Once signed in, you will see a dashboard for managing CKD Plug Ins. If you are not in the technical contact role, you can access the same information by clicking on the top right gear icon, choosing My Organization, and clicking on the Technical tab. Technical dashboard view for other roles, where a plug in has been added. Click on the green Add button to get started adding a plug in. Enter the “Host Page URL” where you will be hosting the plug-in/widget and click on the ‘Save’ icon. The URL you enter must match exactly what you are using to host the plug in, otherwise it will not work. Click “Add” and enter the exact host URL for the plug in. After you click the Save icon, the API Access Key is automatically generated. 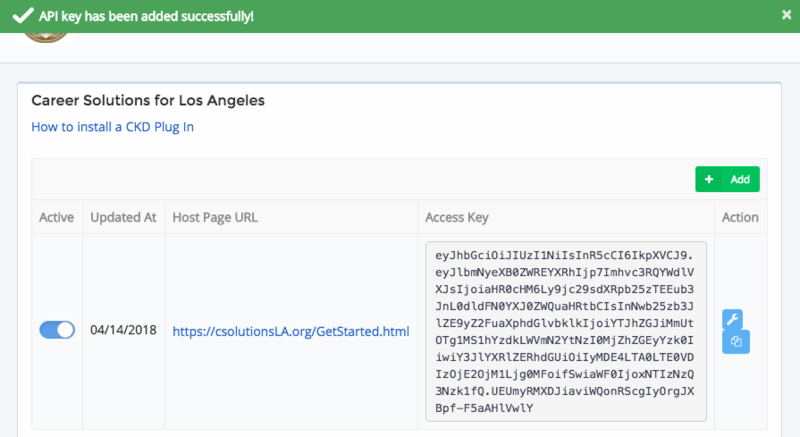 Saved Host URL with API Access Key Generated. Configuration controls the CKD content your students/clients see. 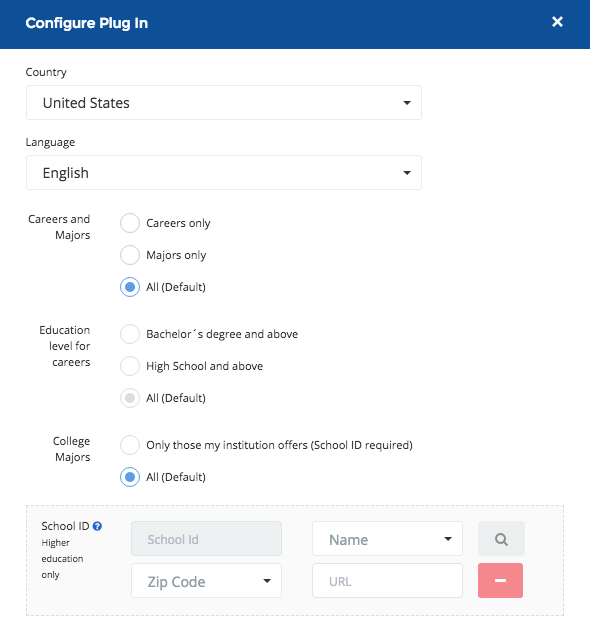 The person who invited you to Career Key, your organization’s primary contact, should let you know if they want the plug in configured differently than the default settings. To see them and to make any changes, click on the Configure icon. Configuration icon leads to a pop up configuration screen. Available options for configuring the plug in. Make any changes, and click Update at the bottom of the screen. NOTE: if you make any changes in a plug in’s configuration after discoverers have started using CKD, previous users may lose saved career or education options from their profile depending on the new configuration selection. If previously discoverers could see Career and Majors and you changed the configuration to Careers only, then any saved Majors will disappear from the discoverers’ profile. Click on the Generate plug in (widget) icon. Click on generate plug in icon. A popup will appear as shown below. Now click on the “Copy” button to copy the plug-in code content. Now paste it into your favorite text editor. Save and host the plug in on your HTML page. B) Write a logic to populate the firstName, lastName and email in the widget dynamically. Name and email values in plug in code. Please make sure not to change anything else in the plug in code or it will not work. If your site’s user registration uses different values than a person’s first and last names, and email address, you will need to take a more custom approach. Notify us at support@careerkey.org and tell us what you need to do and we will let you know if we can support your approach. Please allow 2-5 business days for us to reply. 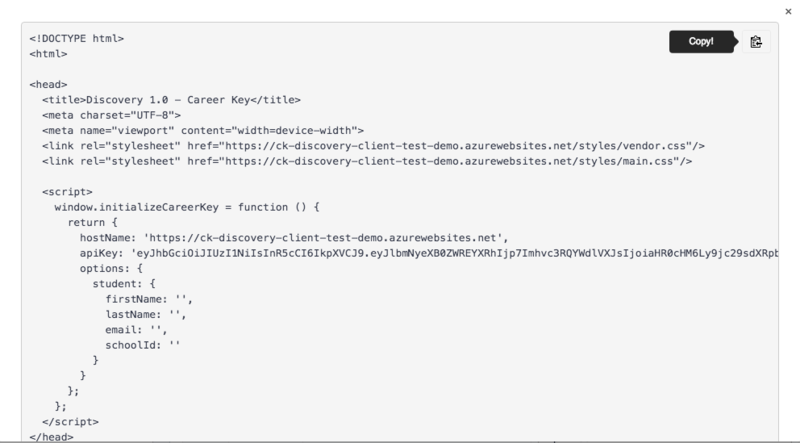 Once your plug in displays correctly on your web page, test it from a sample discoverer’s perspective using a test user on your site. Notify your organization that the plug is installed and ready to publicize.